Within the range of services a typical subcontractor provides, production of plastic parts is frequently offered but normally accounts for only a small fraction of throughput compared with metallic components. Few companies like Dalau in Clacton-on-Sea, the largest specialist supplier and machinists of plastics in the UK, mill and turn such materials exclusively. It places exacting requirements on the purchase of machine tools. As far as prismatic operations are concerned, the firm believes it has identified the ideal 5-axis production centre for machining plastics. Chosen from a list of no less than 18 potential suppliers and installed in September 2017, it is a Hermle 5-axis machining centre that has been modified to accept vacuum workholding fixtures. The machine was supplied by the German manufacturer’s UK sales and service agent, Kingsbury, which also carried out the customisation. 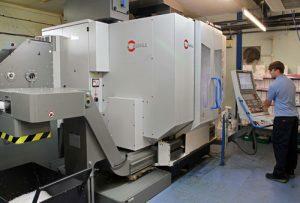 The Hermle installation is part of a £1 million spend on machine tools at the Clacton factory within the past year to cope with a steep increase in demand for Dalau’s machined components across numerous industries. They include automotive and medical as well as the semiconductor sector, particularly in the US and Germany. The expansion has seen the number of 5-axis machining centres increase to six, the appointment of two extra programmers and a move to double-shift operation. “It was also advantageous that the optional Hermle tool magazine extension we ordered for increasing the number of cutters from 30 to 80 comes as a separate unit, which simplified transportation up a ramp and through a narrow opening. “Problems during automatic tool change are one of the biggest causes of downtime here, so we were keen to avoid machines with a swing-arm toolchanger. In contrast the Hermle ATC system, where the spindle travels through a shutter door at the back of the machine and picks the tool directly from the magazine, has proved to be very reliable. Another box ticked by the C 250 was the ability of the magazine to accommodate 300 mm tools, long cutters being necessary for producing many of Dalau’s components. The machine’s trunnion-mounted rotary table configuration is preferred over 5-axis designs employing either a swivelling spindle head or knuckle-type movement of the table. Compared with the latter BC arrangement, Mr Bonds says that an AC trunnion has the advantage of providing better visibility of the workpiece through the large window at the front of the machine when the table is tilted, the swivel range being ± 115 degrees. He bemoans the fact that no machining centres of equivalent size exist specifically for milling and drilling plastics, as with so few dedicated machinists the market would not be large enough to make such a machine commercially viable. So companies like Dalau have to rely on production centres designed for cutting metal, which for processing plastics tend to be unnecessarily large for a given working volume. They are also far too powerful; in the 5-axis shop at Clacton, the load drawn by the spindle motors never exceeds 5 per cent. The C 250 is currently devoted to finish-machining a family of PTFE pump bodies that have been roughed on another of the 5-axis machines. Four or five operations are required to complete the machining operations in total cycle times of between three and four hours. 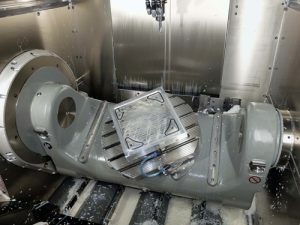 An air conditioned environment held at 21°C ensures that tolerances down to ± 0.05 mm can be held easily, despite the tendency for plastics to distort during machining. The four-part assemblies into which these components go are delivered to a US customer specialising in manufacturing equipment for the semiconductor industry. Indeed, four-fifths of the shop’s output is exported to long-standing customers in the US, where Dalau has had a sales subsidiary since 1990 in New Hampshire. Scott Simpson, 5-axis team leader at the factory concluded, “We opted for an 18,000 rpm spindle rather than the standard 15,000 rpm version to enable high material removal rates; and the 6 m/s2 acceleration to 35 m/min rapids ensures short idle times between cuts. “We use air rather than fluid for chip removal and to cool the cutting zone whenever possible, as it is cleaner and reduces costs. “Kingsbury was very helpful when it came to modifying the machine to accept the vacuum workholding system, which minimises deformation of our plastic components as they are clamped. “Their engineers gun-drilled from the outside to the centre of the rotary table to complete the air circuit and supplied all the switches, hoses and safety mechanism. They also provide good training and after-sales service. We have used the telephone helpline a couple of times and on both occasions they were able to talk us through fixing the problem ourselves, without an engineer’s visit, saving us time and money.